The Mahindra Thar Wanderlust Edition has launched officially in the Indian market. 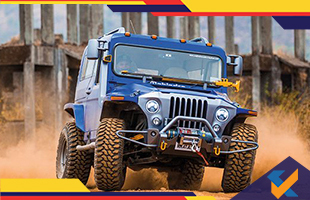 It was shown previously at the 2018 Auto Expo as a follow-up to the Thar Daybreak Edition displayed at the Auto Expo in 2016. The Wanderlust Kit is now available at INR 13.8 lakhs and the Thar now gets a new body and LED projector headlamps in addition to an attractive shade of electric blue with the matte finish. There are high mounted tail lamps which are somewhat reminiscent of the original Mahindra Scorpio model along with gullwing doors, a power sunroof and silver roof rails. There are 35-inch tyres for the Thar Wanderlust Edition along with a lift kit option and slightly changed suspension setup. There is a dual-tone colour option inside along with premium upholstery made of leather. There are suede carpeting and mood lighting in addition to sports pedals. There is a head-up display unit accompanied by the touchscreen infotainment and navigation system from Pioneer which is Android based. The engine is the same diesel CRDe 2.5 litre unit that churns out 247 Nm of peak torque and 105 BHP of power. This engine is mated to the regular 5-speed manual transmission system.